I worked off and on all day yesterday but finally got Annaliese's Christmas dress completed. 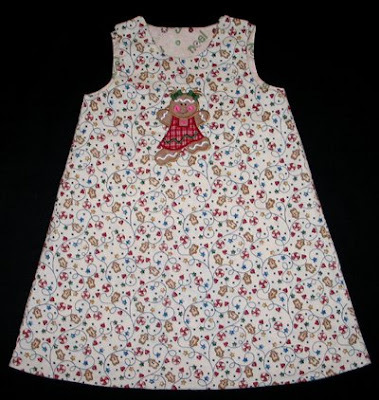 I made a reversible A-line dress using Martha Pullen's pattern, hence outfits 4 and 5. When I had her try on the A-line I made last December, I couldn't believe how much she had grown in 11 months! So I made a size 5, adding an extra inch in length. It's plenty long, and maybe that way she can wear it again next December. Side one uses Gingerbread fabric that I have had for years. 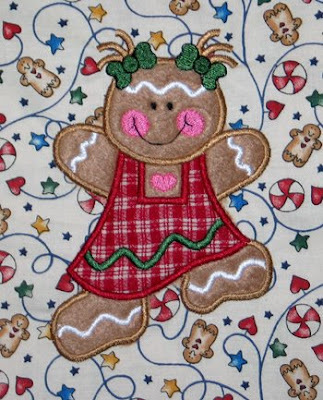 The dancing ginger girl is from Sew Many Designs. I used fleece for the body. Side two uses some snowman fabric that I bought on clearance after Christmas last year. 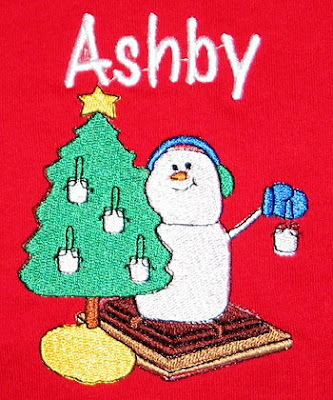 About the same time I got a free snowman head embroidery design from Five Star Fonts and knew they would go well together. I'm glad I actually remembered 11 months later! I used minkee for the face. 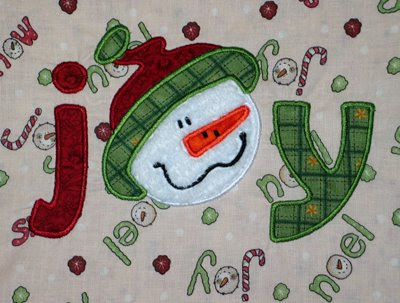 To mimic the word "JOY" in the fabric, I added a lowercase "j" and "y" to the snowman head, from FSF's Hipster Applique Font. Since the overall design ended up being pretty wide, I placed it at the bottom of the dress instead of the the top. 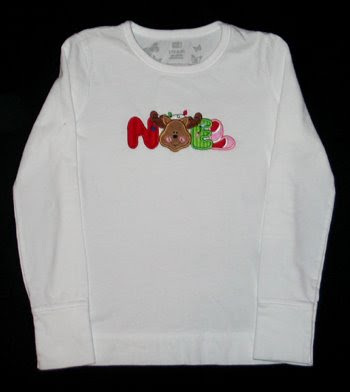 In addition to the Nativity shirt, I got Annaliese's third Christmas shirt stitched yesterday, finishing about 20 minutes before our guests arrived to eat, so I didn't get pictures taken until this morning! Last year I bought these cute leggings at Wal-Mart on clearance after Christmas. I thought the strand of lights was cute and knew I could find several matching designs. 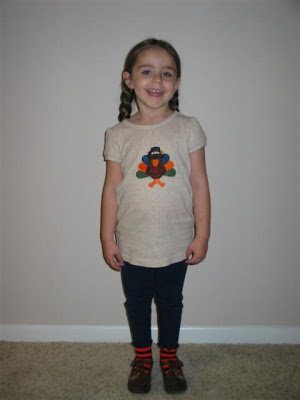 I gave Annaliese several options, and she picked this NOEL design from Sew Many Designs. Annaliese just told me that her favorite letter is the "L" (I picked pink and red fabrics to match the candy canes in the pants) but her most favorite is the fuzzy reindeer. :) I made sure all the lights in his antlers matched those in the leggings as well. So here she is in her third outfit. 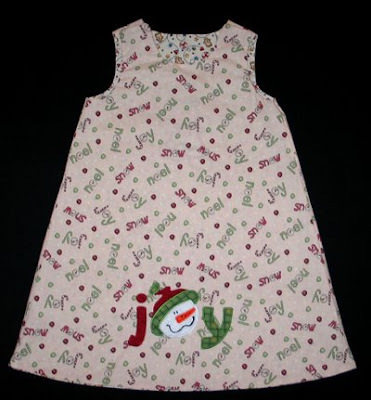 Now I just have an A-line dress to make and I can cross "Annaliese's Christmas wardrobe" off my to-do list! This morning I got Annaliese's next shirt stitched. One of the letter/themes for preschool in the month of December is J for Jesus. 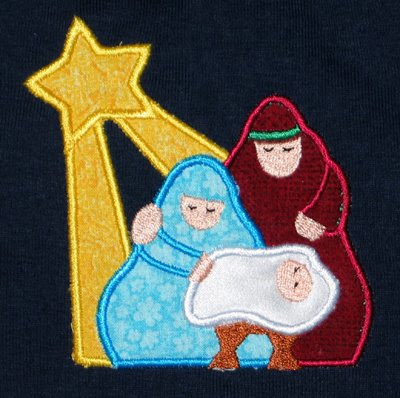 I found a cute applique nativity scene at HeartStrings Embroidery. Annaliese had these leggings from last winter that still fit, but the shirt that matches it is too small. Thankfully Kathy had bought a couple navy shirts in the next size up, so I was able to pick fabrics/threads for this design and make a new coordinating outfit. 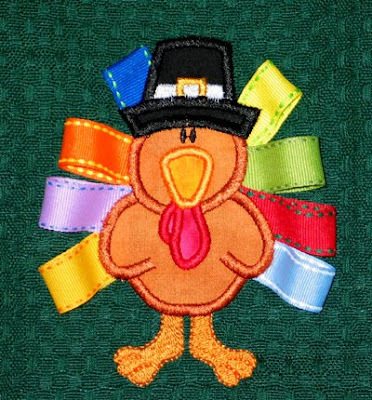 I have been stitching like crazy trying to get orders filled, but for the next few days I'm taking a break to sew for my kids. I have four different Christmas clothing ideas for Annaliese that I want to do, and I need to get started and make significant progress on the baby quilt! 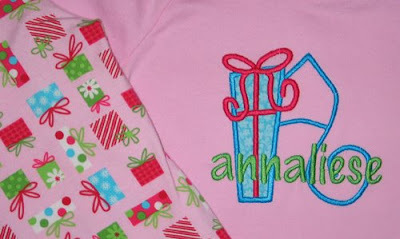 Today I stitched a shirt for Annaliese. In October I found these cute pants at Target and knew immediately that I could use Five Star Font's Gift Box Applique Font to make a matching shirt for Annaliese. It was one of the rare times I paid full price for a clothing item for her! We found the perfect fabric in my stash to match the blue packages on the pants. I added her name with Embird alphabet #8. I like that it's holiday related, but since it isn't the typical red and green, it doesn't scream Christmas, so hopefully she'll get a bit more wear out of it into the spring. If it still fits, it would be good for her birthday in April! She's so glad that I have finally stitched it. 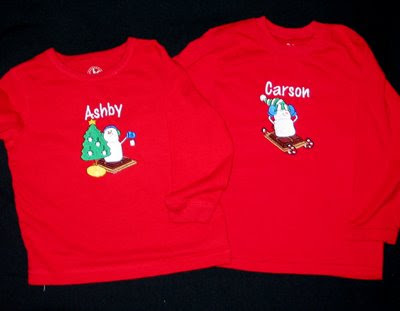 After I gave Angie the Special Delivery onesie for her newest little boy, she asked me about making matching Christmas shirts for all her boys. We spent quite a bit of time looking at designs, and after a futile search for a solid red onesie for the baby, we opted to only stitch shirts for the twins. 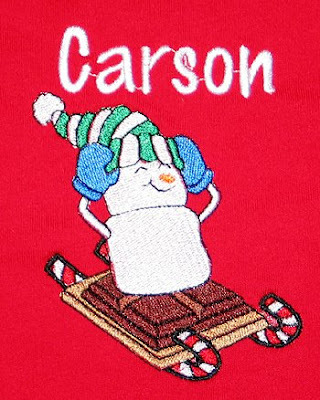 The S'more Snowman designs came from Sew Many Designs. I added the boys' names with Embird Alphabet #8. With only 6 weeks to go, I finally did some initial stitching for our expected baby boy! Carlin's office threw a baby shower for him yesterday, inviting Annaliese and I to join them. It seemed bizarre to go to a baby shower empty handed :) so I decided to make a couple things specifically for my Mr. Carlin Trammel and take them as a surprise. The dollar bill-like frame is from a freebie on Ann the Gran. I deleted the middle of the design and added the text with Embird alphabet #8. 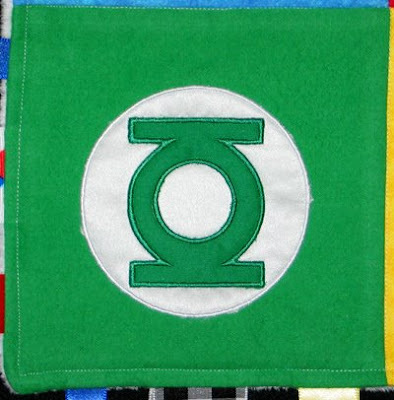 The green cloth diaper is from a pack of Gerber prefold premium cloth diapers. 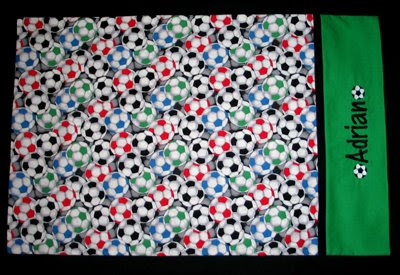 The "boy" pack has 2 each of dark blue, light blue and green. The "girl" pack has purple and 2 shades of pink. I had seen them for the first time when I went to register, and decided I must try them! I'm probably one of the few people that registers for blank diapers, onesies and bibs... thankfully I've started receiving those items and can begin personalizing! 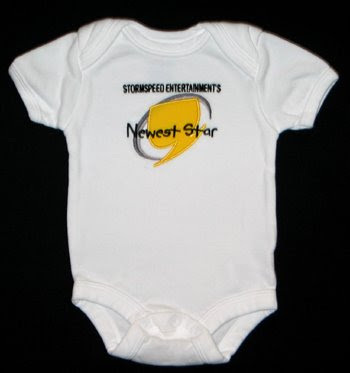 I took Carlin's Stormspeed Entertainment logo that I digitized last week, and added the text "Newest Star" across it. Should be pretty appropriate since Carlin uses Annaliese a lot in his projects. It was nice to finally start to do something for our soon-to-be second born! Jason and Anna are good buddies with little Siena (daughter of mutual friends), who is turning three. Recently Jason and Siena have started a tradition of building a cave whenever their families get together. Sometimes it can be a hassle to find a blanket or sheet to use, so Jason decided to give one to her as a birthday gift that would be specifically used for their cave. 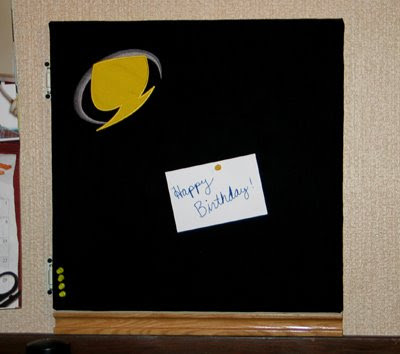 What a creative idea! My camera struggles photographing the black and red combination; trying to compensate with Photoshop really washed out the blue. 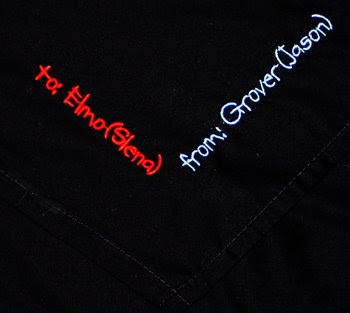 Please know that Annaliese grabbed her stuffed Elmo and Grover and helped me pick thread colors that matched exactly. 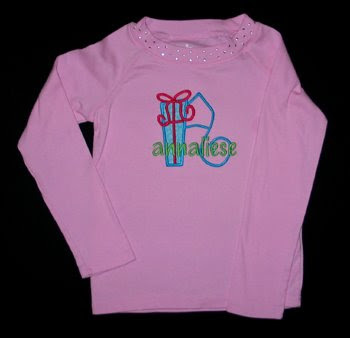 :) Oh, and she picked the pink, too, which is much brighter than pictured. All the colors look much better in person. Maybe the next time the FitzSimmons and Rodgers get together they can take a picture of the sheet in use as a cave! 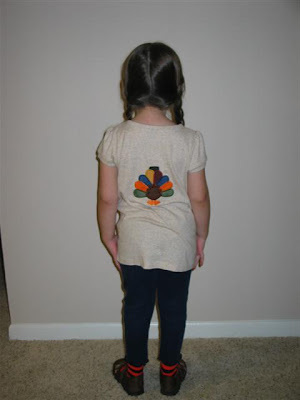 Now, to see how the turkey is originally designed, let me post pictures of Annaliese in her turkey shirt, made for her by Grandma Kathy. 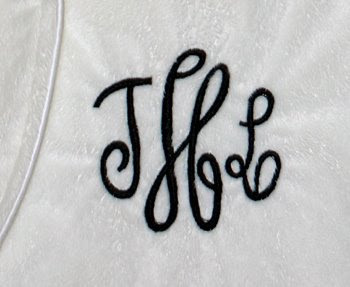 I love the simplicity of the three-letter monogram! 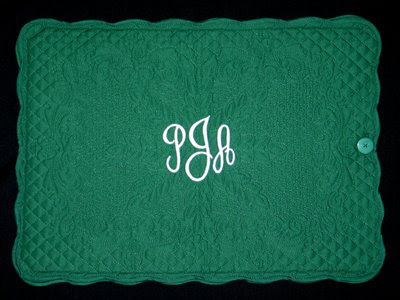 Again, this is from my new favorite monogram set, Empire font from Embroidery Arts. 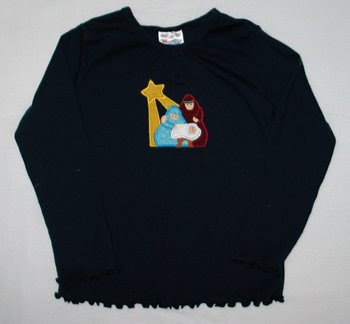 First of all, LESSON LEARNED, test stitch free alphabets, even from sources that have produced nice designs before. 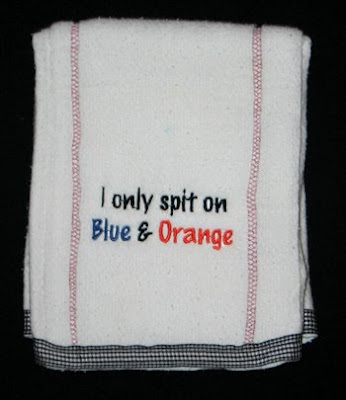 This particular alphabet did not stitch well at all! It puckered like crazy, parts of letters didn't line up, it was a disaster. I should have stopped stitching after the first couple letters, but since I had already constructed the entire pillowcase and was basically on the last step, I decided to let it play out. 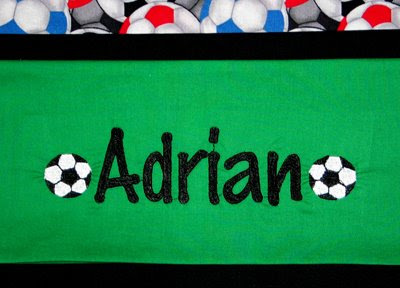 Even though the first half didn't look very good, I was actually crazy enough to try to rehoop and finish the name. You can see from the picture that I did not get it lined up very well. 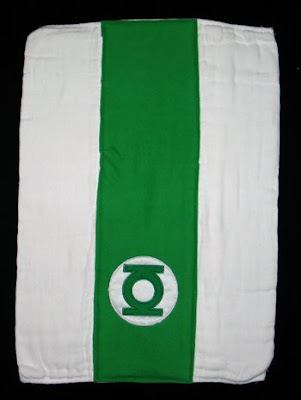 I went ahead and completed the pillowcase, then included it with a load of laundry to see what it looked like afterward. I was pretty disappointed with the results. SIGH. I'm sure it's good enough to sleep on, but I would be embarrassed for someone to say, "Janay made that!" Tomorrow is my husband's birthday. I've had this idea for quite a while, and I'm pretty pleased I pulled it off. Originally our house was built with an attached garage. The previous owner enclosed the garage creating two extra rooms, one that we use for an office (the other is the laundry room). Since the office used to be the garage, the electrical panel box is in there. In the process of enclosing it, the wall became several inches deeper, but the panel box is still along the exterior part. Consequently there was a rather large hole cut out in the drywall, with a cabinet door mounted over it. Decent solution, no major complaints. 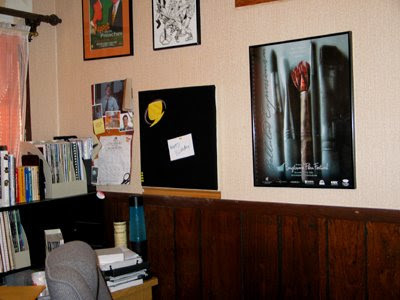 That is until Carlin started hanging pictures, posters and artwork. Then it looked really out of place. 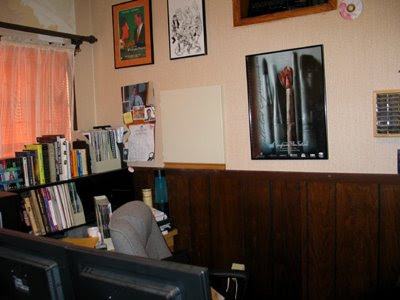 He mentioned a while back that it would be nice to make that door into a cork board or something more functional. I nodded in agreement and filed that away in my head. Today, I finally created a solution. 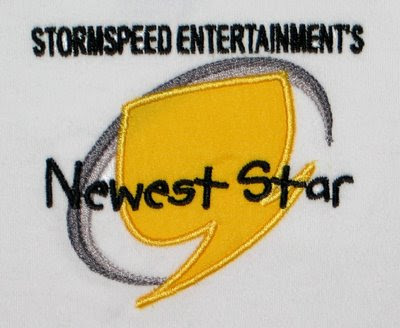 I digitized Carlin Trammel's Stormspeed Entertainment Logo!! I had played around with digitizing a filled embroidery design back in February, and then recently did a few applique designs for a friend. For Carlin's logo, I combined both parts. Certainly not perfect, but I'm really pleased with my first shot. 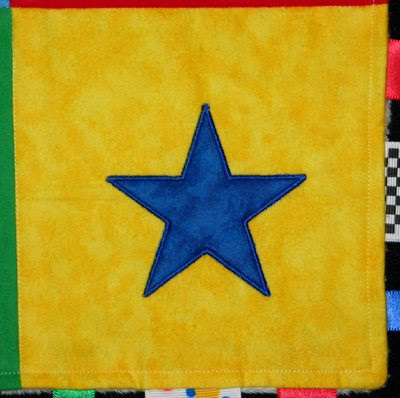 Here's a close-up; actual size of design is about 6"x5.5". 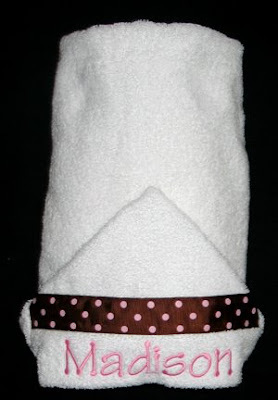 Michelle was invited to a first birthday party, and requested a hooded towel. 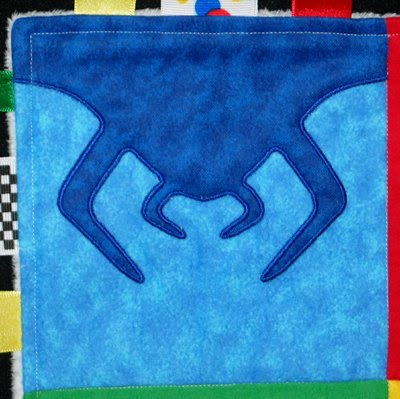 I used Tinker Toy font from 8 Claws and a Paw. 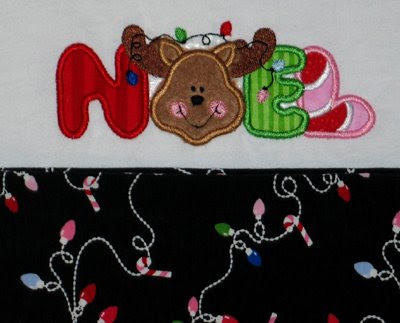 I love how this font looks with polka dot ribbon! Another one of Annaliese's buddies turned five -- Jesse's party is today. When I asked his mom for ideas, she thought he'd like a shirt that no one else in the world would have. :) I can handle that! 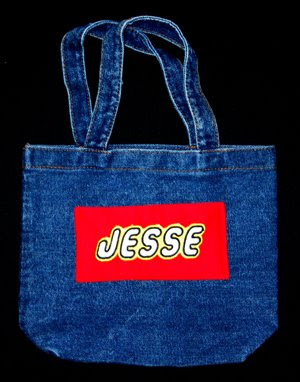 Jesse is really into Legos, so I went on a hunt to find something lego-inspired. Well, there's not much out there! So I enlisted my mother-in-law's help. 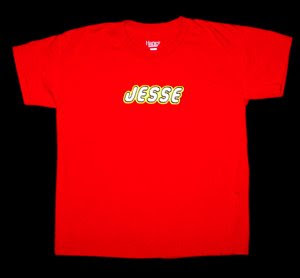 I found a lego ttf, and she digitized "Jesse" for me as double applique letters so I could make his name look like the Lego logo. It's certainly not a perfect match, but I was pretty pleased with the results! 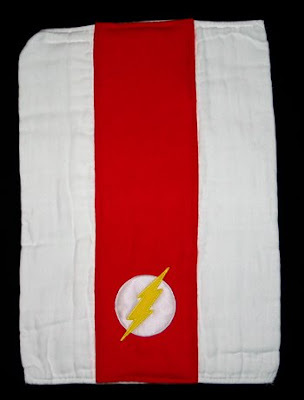 I did a test stitch first on red fabric. 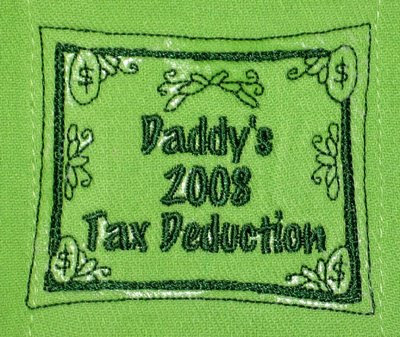 Once I knew it was going to work, then I stitched it onto a t-shirt for him. As I reminded you a couple days ago, mid-March my friends Jason and Anna enlisted my help to announce their big news. 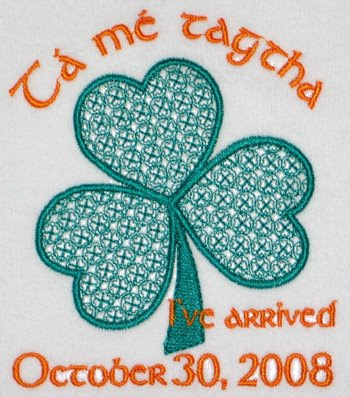 We used the Gaelic phrase "Ag teacht gan mhoill" which means "coming soon" (stitched with Embird alphabet #37) and a shamrock (from Stitchery Mall). 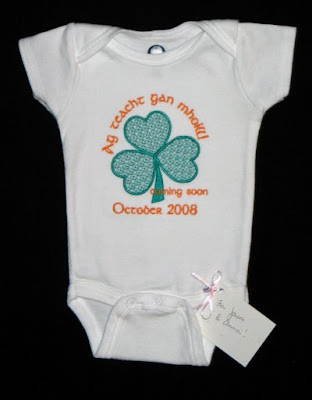 I stitched this design on eight onesies that they shipped out to all their family reveal their secret. 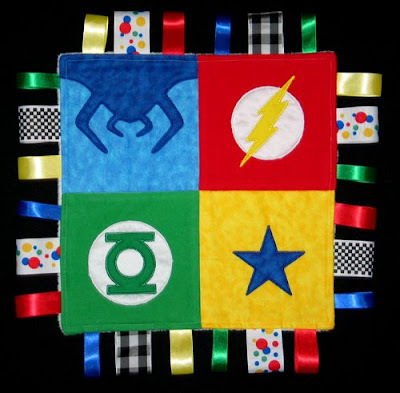 As I was doing that project, I knew immediately one item I was going to make as a baby gift once their child was born. I asked our mutual friend Daryl to help me translate the phrase "I have arrived" into Gaelic/Irish. He pointed to me to a forum, http://www.irishgaelictranslator.com/. I got my translation within a matter of minutes, and then it was just a matter of waiting for the actual birthdate. 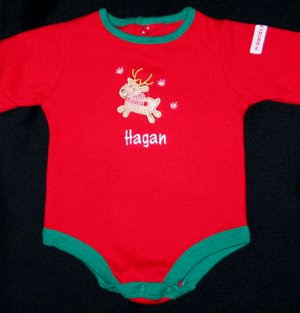 Thankfully little Torin decided to arrive just in the nick of time, so that the onesie could still say October! 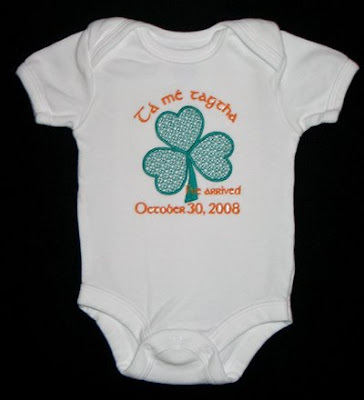 Not my typical onesie design, but certainly unique and meaningful to the parents. The other part of their gift is a creation I'm quite proud of. Jason requested something comic book nerdy that wouldn't be found anywhere else. 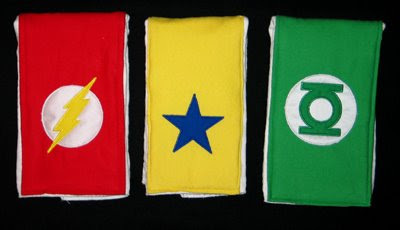 Avoiding the three big-named superheros, he suggested three other lesser-known characters (I threw in a fourth to complete my idea). I got to work creating my own designs. For Christmas I got Studio, the digitizing portion of the Embird software program. I've used it some, but haven't spent a lot of time playing with it yet. 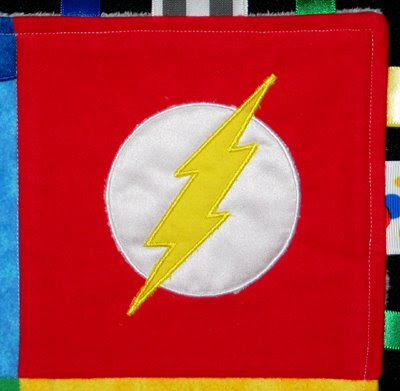 Following a tutorial I figured out how to make applique designs, and created these four different blocks all by myself!! 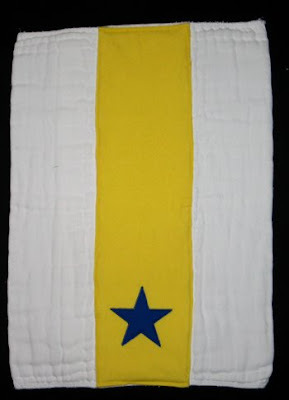 The front is four applique blocks using flannel and satin, the back is white minkee. 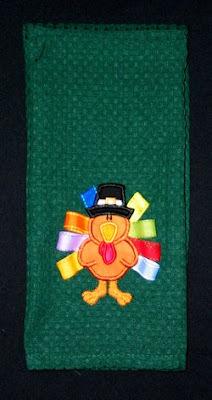 I used an assortment of satin and grosgrain ribbons around the edges. And here are close-ups of the blocks. 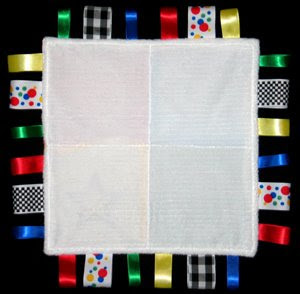 This is another unique, one-of-a-kind gift! I love doing this stuff!